There’s no rest for Kat Holloway, the most talented cook in Mayfair. Not only has her kitchen assistant quit to be married and thus left her shorthanded, Lady Cynthia has a request: she wants Kat’s help to solve a mystery and clear her friend Clemmie’s name. Valuable paintings have gone missing from her household and Clemmie’s husband is blaming her for it. One mystery begets another and another as first Kat learns that antiquities are being stolen from multiple residences, then she finds out that her friend Daniel McAdam is undercover in in a seedy pawnshop. With her curiosity piqued, Kat will have to use all her detective skills above stairs and below to uncover a mastermind willing to kill to protect his secrets. I love falling into Kat Holloway’s world. 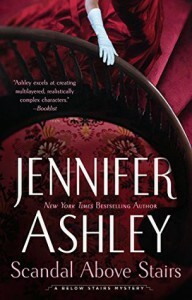 In Scandal Above Stairs Jennifer Ashley drew me in from the start with a seemingly simple mystery that leads to something far more complex and I did not want to put the book down. Kat is the heart and soul of the story and she’s a fantastic heroine. She’s clever, observant, loyal, talented, and kind, but Ms. Ashley keeps her from feeling too good to be real. Kat has a no-nonsense attitude, but she also draws people to her, which is how she finds herself in the middle of this latest mystery. Cynthia trusts and respects Kat, which is why she asks for her help in the first place and I love the unlikely friendship between a rather unconventional lady and an equally unique cook. The characters are what makes Scandal Above Stairs shine. Familiar characters and those newly introduced are all incredibly well-crafted and are like puzzle pieces who fit together perfectly. My favorite relationship is definitely the one between Kat and Daniel. This time around, we learn more about Daniel and the past he keeps secret. I was thrilled to learn more about him and I was excited that he opened up to Kat when he doesn’t trust most people. The romantic tension between Kat and Daniel continues to build and I’m looking forward to seeing how their relationship progresses. Scandal Above Stairs is the second full-length book in the Kat Holloway series and it can be read as a standalone. However, for a more complete reading experience I recommend first reading the prequel novella, A Soupçon of Poison, and the first novel, Death Below Stairs, in order to get a better understanding of the characters and their relationships (Daniel and Kat’s in particular). I hesitate to say any more about this book because mysteries lose their excitement when you talk too much about them. Suffice it to say that Ms. Ashley never fails to entertain and her blend of fact and fiction, of murder and mystery is wonderful. Kat and her friends are endearing, the story moves at a quick pace, I was thoroughly entertained, and I cannot wait to read the next Kat Holloway book!